6 Healthy On-The-Go Snacks That Make You Feel Full - The Co. Whether you’re a stay at home mom who runs an awesome website on the side, a corporate manager, or an entrepreneurial #girlboss, us women are increasingly becoming busier and busier. We have work to do, spin classes to tackle, meetings to take and after all that, cocktails to drink with our friends! Having a loaded schedule is great. As long as you’re not over-exerting yourself, it keeps you on your toes, social and continually learning and growing. Just don’t forget to eat when you’re running from a meeting to a yoga class! Some days it can be tricky to eat a proper lunch, and although you should definitely try your best to do so, we know sometimes it can be downright unfeasible. The next best thing? Pack yourself healthy on-the-go snacks that make you feel full throughout your busiest days. 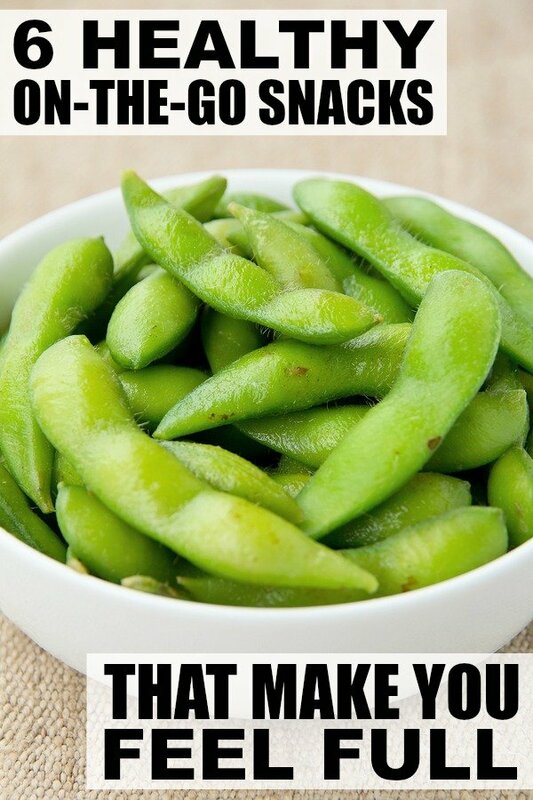 Edamame beans are packed with protein and fiber to kick your hunger and keep you fueled when you need a boost. You can boil them in their pods or roast them for even more protein(!) and bring them with you for an afternoon pick-me-up. Eggs may be the humbled, over-looked snack of choice, but they contain essential proteins, vitamins (D and B-12) and nutrients that keep us kickin’. They’re inexpensive, low in calories and convenient; you can make a batch at the beginning of the week and take them with you on your craziest days. Just make sure to peel them before you head off so they’re easy to snack on. Canned tuna is extremely simple to whip up, either with mayonnaise or mustard and some green onions. Eating tuna ensures you have a good amount of protein, as well as omega-3 fatty acids that maintain cardiovascular and brain heath. The addition of multi-grain crackers also offers fiber, iron and vitamin B. These fuss-free snacks are easy to carry around and filled with protein to ease your hunger. But be wary, many are packed with sugar, making them quite unhealthy. Look for bars that have 10-15 grams of protein and less than 15 grams of sugar. Pack up some of your favourite hummus and veggies (cucumbers, carrots, cherry tomatoes, celery) for an easy-to-eat snack that packs a healthy punch. Chickpeas, hummus’ main ingredient, are loaded with protein to curb hunger cravings and balance blood sugar levels. There are so many options and flavours to choose from these days from red pepper hummus to spicy avocado hummus, and if you’re feeling creative, it’s easy to make on your own! Okay, so these are something you’ll have to make the night before, or on the weekend as you prepare for the week ahead, but having blueberry flax oat muffins to grab on-the-go makes for a snack that’s both healthy and delicious. Flax is high in fiber and omega-3 fatty acids; oats are an amazing source of fiber and nutrients; and blueberries are one of the world’s greatest anti-oxidants. If you found these healthy on-the-go snacks suggestions helpful, please share them on Pinterest! And if you’re looking for more health-related tips and tricks, please follow our Health & Fitness board where we share all kinds of inspiration! This is an excerpt from the article 6 Healthy On-The-Go Snacks That Make You Feel Full which originally appeared on http://www.cloudywithachanceofwine.com/.